What does BCI mean in Council? 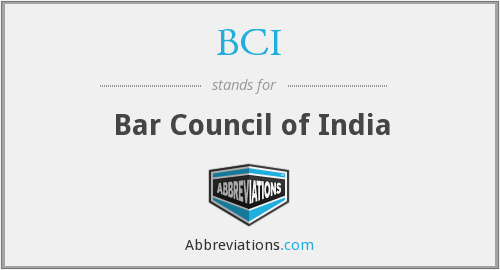 This page is about the meanings of the acronym/abbreviation/shorthand BCI in the Governmental field in general and in the Council terminology in particular. The Bar Council of India is a statutory body that regulates and represents the Indian bar. It was created by Parliament under the Advocates Act, 1961. It prescribes standards of professional conduct, etiquettes and exercises disciplinary jurisdiction over the bar. It also sets standards for legal education and grants recognition to Universities whose degree in law will serve as a qualification for students to enroll themselves as advocates upon graduation. "BCI." Abbreviations.com. STANDS4 LLC, 2019. Web. 25 Apr. 2019. <https://www.abbreviations.com/term/2058851>.